Hi, I am your go-to guy if you want to get things done in Vietnam. I prepare you to work with factories in Vietnam and introduce you to them. May I help you find thermal underwear manufacturing in Vietnam? Thermal underwear is a set of clothing, most often a long sleeve shirt and pair of long under-pants. They are sometimes called “long underwear” or even “long johns”. People wear them underneath the outer clothing in cold weather. For maximum insulation, thermal underwear should be worn under other warm clothes that keep heat against the body instead of letting it escape into the air. On days where it is chilly but not extremely cold, a thermal shirt can be worn underneath a regular shirt, or even worn as a shirt by itself, since it is often cut and shaped like a normal shirt. Thermal clothing generally comes in neutral color as it is used as inner wear and not seen. In extreme cold, the outer layer should be wind and rain resistant so that thermal underwear can do their job of retaining heat. How does thermal underwear work? Thermal underwear works on the principle of insulation. The material used in these clothes basically adds a layer of insulation between the body and the garment. The material absorbs minimal amount of moisture from the body, allows quick drying and regulates airflow in the insulating layer that is formed. The material is closely knitted so that the thermal wear retains the warmth produced by the body. Cotton does not offer the insulating properties when it becomes wet. But wool allows insulation even when it is wet. Also, wool is a naturally occurring fire retardant, and is hence advantageous over cotton. What is the fabric used for thermal underwear? Polyester is a typical and common synthetic fabric used in the manufacture of thermal clothing. Sometimes the polyester material is blended with spandex to give extra stretch and durability. The fabric has a knit structure that is small and very tight, allowing good thermal and breathable qualities. At present time, thermal underwear made from 80% polyester and 20% viscose fiber is used extensively in the cold countries. Because it’s thermal property is excellent and the pricing is not too expensive. 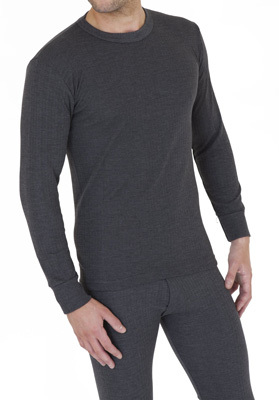 Another popular material that is now widely used in thermal clothing is Merino wool. This fine wool variety is perfect for under garments as it is both comfortable and efficient in its thermal qualities. Besides, Merino wool also has a better moisture absorption property than polyester fabric. Therefore it is sometimes preferred to the polyester type materials. How to choose thermal underwear? When you buy thermal underwear, just try on a set underneath your clothing. Remember to test different movements to make sure the material will not bunch up, roll or otherwise cause discomfort after a long day of wear. Buying a slightly smaller size might help you reduce slipping and bunching, as well as make it easier to fit the underwear underneath your blue jeans and other woven outerwear. However, you should be careful when choosing a smaller size because some might shrink slightly after washing. 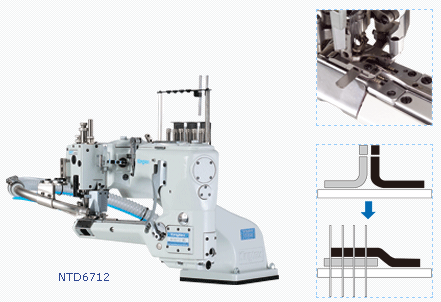 We have 43 Kingtex NTD 67 12 Flat lock machines that first cut the ends of the seam evenly and then lay them on top of each other and stitch the seam. Thai Son S.P garment manufacturer based in Ho Chi Minh city Vietnam. Thai Son S.P is a family owned FOB garment manufacturer that has been in the producing garments for 22 years. They have two factories. They are currently doing a lot of thermal underwear and would like to find new customers. Thai Son S.P knits fabric, sources trim, sews your garments and delivers the finished goods to Saigon ports where your freight forwarding company picks up. They follow your spec sheets and produce according to your designs. They offer one FOB price. Thai Son describes themselves as a thermal underwear manufacturer in Vietnam. They have flat lock machines and can source Merino wool which is why they call themselves a thermal underwear manufacturer in Vietnam. Are you sourcing a thermal underwear manufacturer in Vietnam? If yes, then contact us below. Are you a start up fashion brand? If you are new to working with Vietnamese clothing manufacturers then I recommend my book as the perfect place to start. I discuss 16 questions you need to ask yourself and be able to answer before meeting with factories. I share insider tips about culture and language as well as make referrals to my network in Vietnam. Here is what one reader shared with me after reading my book. I did not expect to find so many hard facts backed up with real contacts for products and services in the industry. Usually people do not give away easily this hard earned information which is garnered over many years of work.